We’ve heard some incredible stories from 23andMe’s customers, but Menachem Bodner’s brought us to the edge of our seats. A Holocaust survivor, Menachem has been searching for his twin brother, ever since the two were separated in Auschwitz when they both were only four. Although his search is not yet over, thanks to some incredible detective work by the genealogist Ayana KimRon and testing with 23andMe, Menachem is a step closer having found first cousins in California who were able to give him more details about his mother and even share with him a photo of his parents. The first picture he’d ever seen of them. Menachem, with Ayana, seeing a photo of his parents for the first time. Ayana first spoke with us early this year, telling us about Menachem’s search after 23andMe contacted her with an offer to help. She had already done an incredible amount of work, using Nazi archives, immigration records, documents from Auschwitz and other sources to piece together as much as she could about Menachem. She found his name at birth – Elias Gottesman, his brother’s name Jeno Gottesman, their place of birth in the Carpathian Mountains of Hungary, and the names of their parents, Roza and Ignatz Gottesman. Ayana also tracked down what happened to Menachem’s mother, Roza, who survived Auschwitz only to die at the hands of anti-Semitic rioters in her hometown in 1946. But from there the trail ran cold. Menachem, who was adopted by a couple who survived Auschwitz and then immigrated to Israel, has never given up and he has found someone who is equally committed in Ayana. Using 23andMe results, Ayana was able to help Menachem connect to three first cousins in California. “I knew about their existence but DNA was a miraculous short cut,” Ayana said. 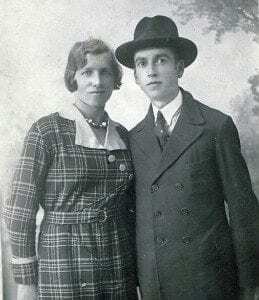 Their mother, Menachem’s mother’s sister who immigrated to the United States before the war, had told them about the family and sister she left behind. They in turn were able to tell Menachim about his mother, and share with him a photo of his parents, giving him the first opportunity to see an image of them. Ayana shared with us a photo of him seeing his parents for the first time. Menachem is still searching for his brother. To help in his search Ayana has set up a Facebook page here.